Piganò House is a recently renovated ancient house, dating back to the 16th century, preserving its original charming rural qualities. The house is centrally located in the former old historic center of Appiano. It is situated in a wonderful area with its own unique castles and aristocratic residences, vineyards and beautiful surroundings. It is an ideal destination for hikers, bikers and culture lovers. The apartment has two bedrooms, a bathroom, a living room and a small kitchen. In the living room there is a sofa bed, in a fifth sleeping opportunity is needed. Smoking is not allowed in the house. Guests can use the courtyard and the old historic cellar. As I live near my guests can contact me any time. The neighborhood is characterized by a lot of buildings dating back to the 16th - 17th century with elements of German Gothic and Italian From here you can easily reach the woods for a nice walk. With a 10 minute stroll you can reach the center of the village, where you can find nice cafes, restaurants and shops. Appiano is a relaxing and an active holiday. 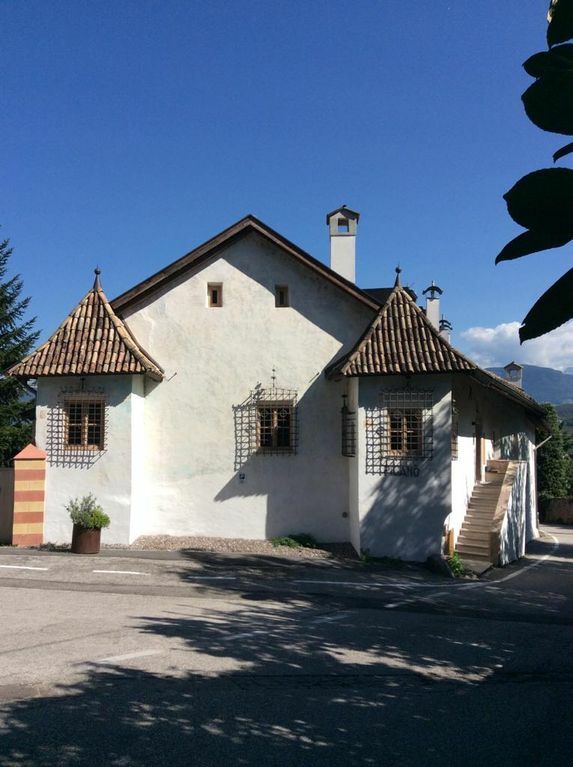 It is a 20 minute drive from Bolzano and it is also available from 6am to 12pm (15 minute walk to the next bus stop). Monetolo and Caldaro as well as the cities of Bolzano and Merano. You can rent bicycles in the village. Also hiking paths are amazing in this area. The Dolomites (Unesco World Heritage) - a paradise for rock climbing, skiing and hiking - are an hour s drive from here. Pets are allowed only under certain conditions. For information please contact the host. pets are allowed (no puppets) under certain conditions; an additional cost of 8 euros per day will be applied; there is only 1 parking place for each appartement. Winterurlaub mit drei Personen und unserem Hund, dafür war die Wohnung absolut ideal. Für einen Sommerurlaub würde uns persönlich allerdings Terrasse oder Balkon fehlen. Hochwertige und stilvolle Einrichtung, Lage an einer kleineren Durchgangsstraße, aber nicht wirklich laut oder störend, nachts so gut wie kein Verkehr. Haben uns sehr wohl gefühlt, auch, weil sich die Vermieterin sehr um ihre Gäste bemüht. Sehr schöner Ortskern, der nur wenige Gehminuten entfernt liegt. Dort findet man alles Notwendige und einige durchaus empfehlenswerte Restaurants. vielen, vielen Dank für die positive Rezension! Es stimmt, diese Wohnung hat kein Balkon, doch in der wärmeren Jahreszeit kann der ruhige Innenhof sehr wohl mitbenutzt werden. Ich hoffe jedenfalls, Sie bald wieder in Eppan begrüßen du dürfen. Appiano is a relaxing and an active holiday. It is a 20 minute drive from Bolzano and it is also available from 6am to 12pm (15 minute walk to the next bus stop). Monetolo and Caldaro as well as the cities of Bolzano and Merano. You can rent bicycles in the village. Also hiking paths are amazing in this area. The Dolomites (Unesco World Heritage) - a paradise for rock climbing, skiing and hiking.